I am a newbie to Blender so please excuse if this is an easy question. Have searched for it in blenderartist but have not found an answer yet. Is it possible to put a force (like gravity) on an armature? The problem I have is this, I have a tube (e.g. a rope) connected on both sides to objects and I would like to simulate the slag in the rope due to gravity. Currently I have the tube attached on both side and the armature is bulging the rope UP not DOWN (the attachment on one object is a bit up, guess that make this the easier armature position). So the question would be how to apply gravity on the armature, so that it actually curves down like with gravity. mmm…not as far as I know. Haven’t played around enough with Blender’s dynamics to be 100% sure. As an alternative, I would recommend a soft body to the object itself. That has gravity on it and you can pin it to the other object. (Also add stiffness so that it looks like a rope, and self collision) That should work, unless there is a specific reason why you want it to be an armature? Well I am using an armature as I have pinned the tube on both side to objects. I would like to be able to move those objects and keep the tube connected at all times. Would that also be possible with softbody? Right now I do not seem to be able to wrap my head around the concept properly. Could you maybe include a picture so that it’s a bit more clear? But I will certainly have something up here later today. Hi here I am again. In these two picture I show the top and side view of the project I am work on. 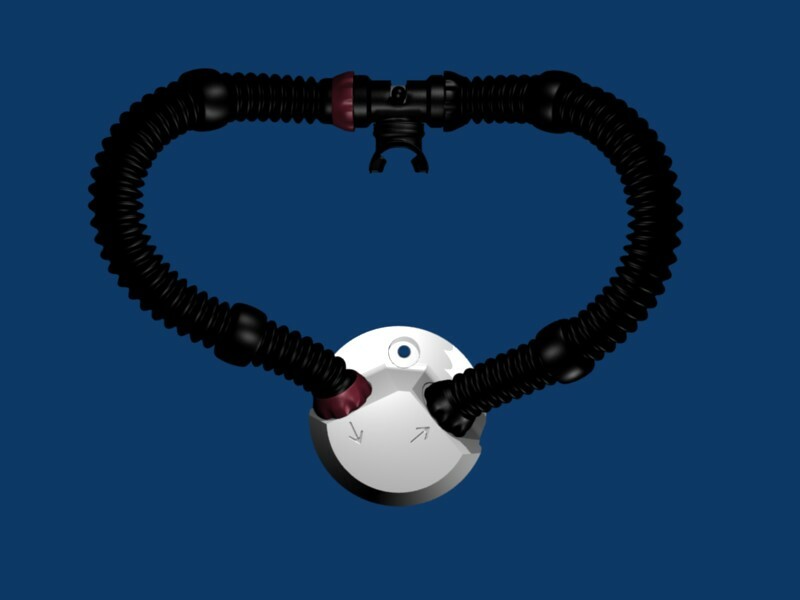 This is a Rebreather (or better will be), it is a sort of scuba diving gear for which I am creating some animation. From the side view one can see that the tube bulges up and defies gravity. Actually it should be slagging in the middle. Since I would like to move the mouthpiece during the animation it would be nice to have the tube attached to it at all times. Moving the mouth piece should move the tube as well. In the side view one can see that the Rebreather (the white plastic piece) has an angle at which the tube is connected, this is probably the cause for the bulging up. Getting a sort of gravity in the middle of the tube to actually move it down would be the best thing. Moving individual bones down doesn’t work, maybe due to wrongly set envelopes? Should I use weight painting instead? Any help to get a more naturalistic view is appreciated. Just wanted to bump this thread up again, since I have not found a good solution for it yet. Danke, I will definitely try that.